As survivors of breast cancer, Peggy Fleming and I have joined in the fight to find a cure for this dreaded disease. I have designed a bracelet made of sterling silver, crystal, and Venetian glass beads, handmade in Murano, Italy. The net profits of the sales of this bracelet will be donated to the Victories Campaign against breast cancer. Recipients of the funds will be the V Foundation for Cancer Research and the Lombardi Comprehensive Cancer Center at Georgetown University. 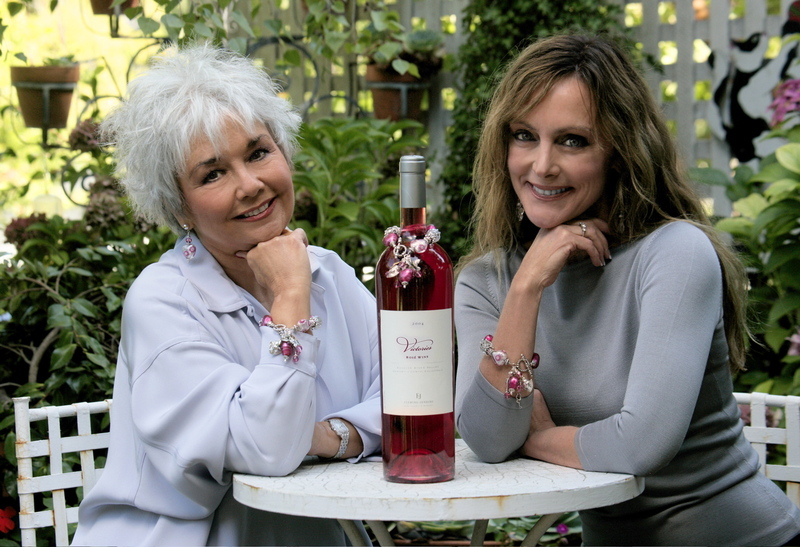 Due to the number of requests we have received for the Victories bracelet, we are continuing the Victories Campaign Against Breast Cancer through October 2007 at this time. The bracelet is full of symbolisms; the color pink is for femininity. The crystals invite good luck. The hearts tell of the love of friends and family. 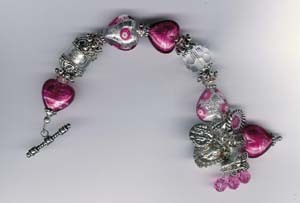 The silver hearts with pink millefiori flowerettes symbolize the female breast. The charms are the butterfly, for life evolving and emerging. An ice skate, for Peggy�s stellar career. The angel, for heavenly protection. The ribbon is the symbol of the fight for a cure. A golden colored bra says �there is always a way�to look beautiful. The MD charm is my identity as the designer. 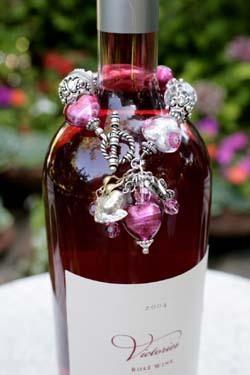 And finally , the �Made with Love� heart that accompanies all of my jewelry. $2 from every bottle of this and future vintages of Victories will be donated to charities supporting the cause, including The Lombardi Comprehensive Cancer Center at Georgetown University and The V Foundation for Cancer Research, both 501 (c) (3) non-profit organizations. In addition, we have added two local organizations as beneficiaries for the program: the Community Health Breast Project in Palo Alto and the VMC Foundation at Santa Clara Valley Medical Center for the Sobrato Cancer Center.